In the digital age, it is so easy to keep up with people. You’ve got acquaintances on Facebook, emails with your distant relatives, texting with your grandparents, and tweeting at celebrities and politicians. But in all that messaging, we lose some of the personal touch. I propose that for at least one person in your life, you ditch the digital and instead try writing letters. Something about the act of writing things out by hand on physical paper, sealing it in an envelope, and putting it through our fantastic U.S. mail system makes the whole message feel much more personal and enjoyable. I know I love receiving cards with notes in them on holidays or birthdays. 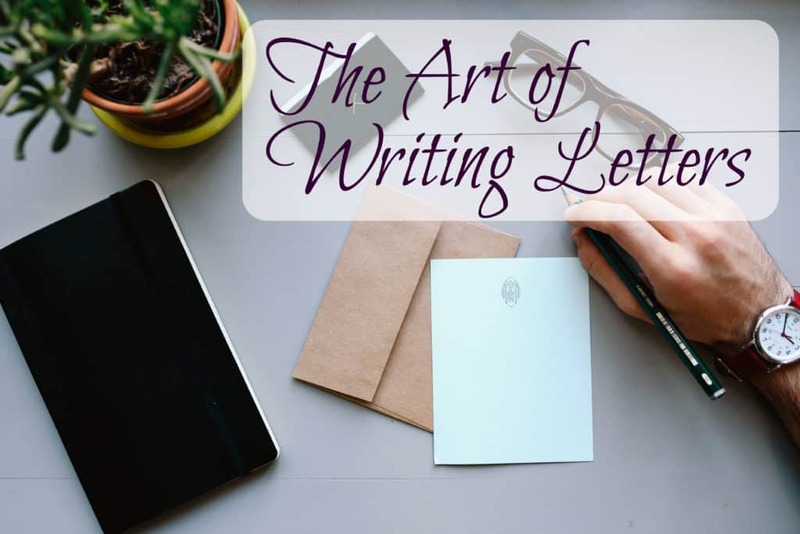 I think that writing letters is a lost art that we need to revive together. So what’s in it for you? You feel more in touch with the person you are contacting. You get to take a moment out of your hectic schedule to just breathe and write. You get to practice your handwriting. You can use all your fun stationery supplies for a totally legitimate reason! Lord knows that I love using my Pilot Metropolitan on anything that will stay still long enough. I’ve been using it in my Leuchtturm constantly, but I like experimenting with what papers go really well with the smooth liquid ink. Some handle it better than others, like the Rhodia Dot Grid Notepad. Writing letters has given me a great excuse to play around with what supplies I have in a totally guilt free way. Who can argue with structured play like that? Plus, I think there is a large benefit in siting down at a desk with nothing but smooth paper, a fine pen, and a message to send to the recipient. It’s a lot easier to really communicate, I think, because I always feel distracted with email and text. I’m never giving the digital message my full attention no matter how hard I try. Notifications popping up interrupt my train of thought or the nature of my location (which is usually out in the world) doesn’t allow me concentrate. But I can really focus on my thoughts and words when I’m writing it down, and I bet you’ll have the same result (hint: lighting incense and listening to ad-free Amazon Music helps). These are dummy letters. I can’t be letting you see my relatives’ addresses. They’d skin me alive! Who Should You Write Letters To? Your Grandparents – Come on, if they can learn how to text for you then you can throw them a bone and write a damn letter every now and again. You will be making them very happy and you know it. Pen Pals – Bond with a stranger over a similar interest! You can head on over to the Bullet Journal Pen Pals Facebook group if you want to get started there. Or there are a ton of other hobby groups where you can find a pen pal. Your Representative – This is actually a great way to express your opinions to your Senator or Member of Congress. Jon (my husband) spent five months as an intern in a Senator’s office in D.C. I won’t give names, but I will say that this Senator received a report every day regarding that day’s mail, and the interns would pick 20 letters that had good questions or good points. The Senator committed to writing those 20 senders a response every day. So if you feel strongly about a point, try writing your politician about your opinion. Handwriting is so much better than tweets or emails because they can see how much you care by how much time you took to express your opinion. Just remember to be polite! Celebrities – I’ve never tried this one, but why not? If you think that an actress has done a particularly great job in a role, send some fan mail! If you appreciate the work a philanthropist has done, shoot a letter their way thanking them for their efforts to make the world a better place. Be an encouraging force! Bloggers – I know I would love to receive mail from you folks! My address is at the bottom of this post if you’d like to send me a letter! Like I said earlier, it feels very personal and I love it! Just note that it might take me a while to respond since I get so many lovely letters from folks like yourself. Friends – This is great for friends who live far away! I know I have my fair share of those. So why not keep in touch in a way befitting your awesome friendship? Write letters to stay in contact in a very personal way instead of the quick glance on Facebook. Your relationship will thank you! Yourself – Nothing is quite as emotional as receiving a letter from yourself. When I was a senior in high school, my English class had an assignment where we wrote a letter to future us, and our English teacher held onto them for a year and sent them out in my first year of college. Receiving that was funny/sweet/nostalgic. If you don’t have a teacher to hold your letter for a year, I’d suggest you put it out of sight in the back of a drawer. Then set a reminder on a digital calendar and have it notify you one year in the future. 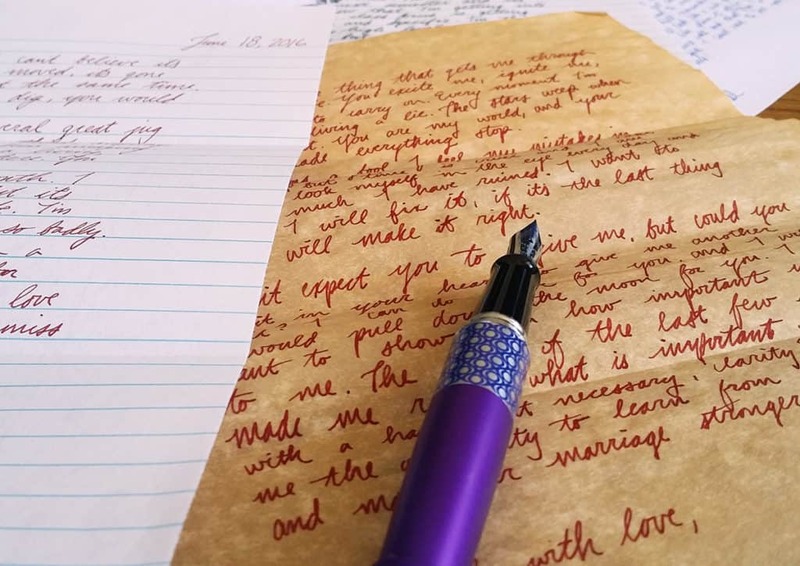 I like writing my letters to myself on fancy parchment paper and sealing it in a parchment envelope to make it feel like I’m receiving a letter from Hogwarts. Does that make me weird? So be it. What are you waiting for? Writing letters is fun, therapeutic, and has a much deeper meaning to the recipient than a boring old email. You could try your cool new stationery and get to enjoy the simple act of writing, doodling, or drawing. So what it takes a little bit longer than a digital message? It is so very worth it for both you and your lucky recipient. I bet you will find that you love it more than you expected. And just wait until you get a reply in the mail. It will be so exciting receiving a letter that isn’t a bill! So get out there and start writing some awesome letters to people! Shelby, thank you for this article. I was able to find penpals for my children in my husband’s family group on Facebook. I think cousins and extended family are a great source for penpals. That’s such a great idea Nina! I love it. 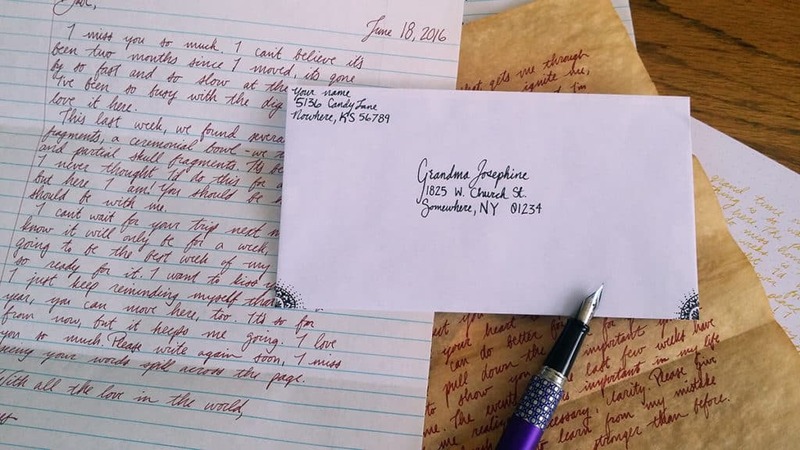 Great article, I’m all for snail mail, and making the effort to hand write letters. I agree Alison! There is just something wonderful about it. Thanks a lot for your help and suggestions ?. I’m from India and I would like to write you a letter, do I have to write the letter to this given address or do I have add anything else too? Hi there Aishwarya! You should be fine writing the address listed, though you can always add “United States of America” below the last line if you want. Thanks for asking! I think I need to find parchment paper….Let that freak flag fly. LOL You could also write letters to your kids. save them up in a keepsake box. Or perhaps begin with the email version (set up an account for your kiddo, send emails to it, and at a later date give them the address and password.) but I like the idea of writing letters better. Now if I could just remember to do it! That’s a fantastic idea! I hadn’t even thought of writing letters to your growing children. I’m gonna have to do that one day 😀 Thanks for that suggestion! I LOVE writing letters with my grandma, we both get so excited when we receive one, plus she always includes a new picture on each card. It’s so fun to write, and even make your own cards I wish more people wrote letters! If I had a PO box I would totally encourage people to write to me! My grandma used to be the card QUEEN. That woman made a handmade card specifically for each grandchild (we are an army of grandkids) for each holiday, even the minor ones. They were the best to receive because she put so much love and care into each one. Now she’s gone, so all those cards are cherished keepsakes. That’s one of the beauties of letters – they become a memory after the conversation is over. I’m so glad you appreciate this as much as I do! Good timing! I just read this after writing two short notes, a “thank you” and a “thinking of you”. Last week I started getting back in the habit of sending snail mail. My 7yo niece wrote me a letter today – I’m so excited to write back! There’s nothing better than a letter chain with a child. There’s always something to talk about! Also, it’s super cute. Isn’t it funny how exciting it is to get something in the mail that isn’t a bill? When I was a kid, I only got nice cards and letters from people – now my mail always demands money!